[Informer] Evil Dave and DOOM DOOM, DOOMLY DOOM! Post subject: [Informer] Evil Dave and DOOM DOOM, DOOMLY DOOM! *gasps loudly* Finally... fresh air... a quest! It's been a long and strange year for Runescape, in general, to be sure, and that is perhaps most appropriately said regarding the quests released this year. Although we began the year with a penguin quest, all we've really had since then were the four "quests" released with Menaphos, and in my opinion, these last four shouldn't belong on the list because they go against the general questing spirit and are the reason I no longer am a card-holding member, but I digress. This article is not about the recent dearth of content but is instead about the breath of fresh air that this most recent quest is to save this year from ending on a bad note. So let's get into the summary and analysis of Evil Dave's Big Day Out! To begin the quest, make your way to Evil Dave in his BASEMENT OF DOOMLY DOOM!!!! *coughs* Forgive me, it seems the transformation back takes some time... 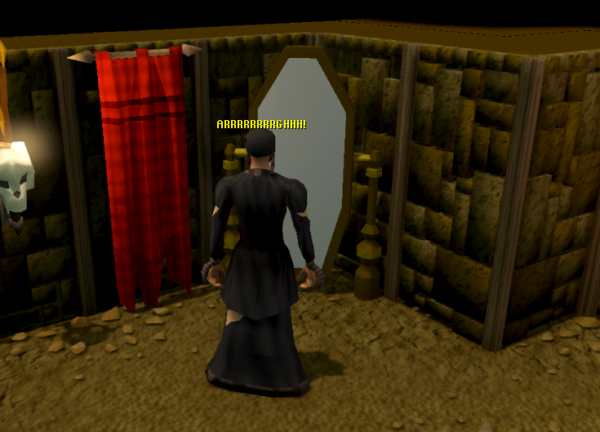 Regardless, begin in the typical fashion by speaking to Evil Dave in his house in Edgeville and asking if there's a quest that might be done! If you have the proper requirements filled to begin the quest, Dave will then offer you a quest and off we go. Apparently, Dave has been obsessing over Zamorak ever since the Sixth Age began (what, over five years ago in earth years?) and Dave desperately wants to get his attention. To do so, he needs the player's help to conduct an EVIL ritual of some sort. However, as Dave has poor handwriting and the player has difficulty reading the incantation properly, the ultimate consequences of the ritual are that the player character and Dave switch bodies, a la Freaky Friday. When you're finally able to come to, Dave (now in your body) is nowhere to be found and all you can do is go up to Doris to try and see what you should do next. Believing the player to truly be Dave, Doris expects Dave's chores done, and that's exactly what you must do. After cutting vegetables, sweeping the rug, washing the dishes, and cleaning the bed, the player character takes a nap on Dave's bed and dreams of Dave in the player's body speaking to Moia and Zamorak in Daemonheim where Dave is, of course, acting strangely which raises some suspicion from those around him. Still, Zammy tasks "real Dave" with infiltrating and spying on a meeting for Saradomin in Falador. Once you wake up, Doris seems satisfied and leaves "Dave" at home while she goes to the Grand Exchange. Seeing this as an opportunity to search Dave's personal belongings for help in getting out of this predicament, the player then searches Dave's personal book stash to find some rather interesting book titles and text boxes that will be discussed in more detail later on! After finding his spellbook in the bookshelves and some runes in a hidey hole behind some drapes, the time seems right to make off to the Makeover Mage. The idea here is that disguising Dave's body in a female form will allow the character in this form (real Dave is banned currently from entering Falador) to enter Falador and stop real Dave before he can spy on Saradomin's meeting. But of course, nothing goes as planned and the teleport you actually cast is to the Grand Exchange, where you are very nearly caught by Doris who is shopping for groceries. After she leaves, the player needs to access Dave's bank to get new runes to teleport once more. The earth rune can be gained by speaking to the banker and the law rune will be in Dave's bank along with an "emergency flask of stew." To get the air runes, you speak to the Grand Exchange employee who will only give Dave a law rune for a drink (but not his stew because it's too spicy) so you empty the stew into your own mouth and fill the empty flask in a fountain. After drinking the slurry (with a "hint of orange"), you now have all the runes needed and teleport successfully to the Makeover Mage! After ensuring to the Mage that you are who you claim to be, he/she agrees to transform you into a female form, even agreeing to maintain the lovely beard! Now as Davina, the mage teleports you back to your home where Doris arrives shortly after. Despite having no evidence to go on outside of the fact that "Dave" smells "fresh," you now find yourself to be double grounded. And as such, a new round of chores are in order: the same as before! However, the chores do not go so smoothly this time and the broom, knife, and a dish all break, requiring the player to take a trip across the road to the general store. After some rather hilarious interactions, "Dave" is simply given the materials he needs and makes his way back home to finish the second round of household duties. Once the bed is cleaned, another nap ensues and thus another glimpse into the actions of real Dave in your body. This time, Dave is in Falador Park speaking to Sir Tiffy about becoming an elite white knight in hopes of getting into the aforementioned meeting. Dave must, therefore, re-do the training that the player went through, even including a rather funny cutscene involving Dave and the sea slugs wherein the mind-controlling sea slugs actually give up their plans in the face of Dave's authentic brand of insanity. Real Dave is now in, and the player wakes up once again. Evidently, Gertrude's cat problem is only getting worse, so Doris let's "Dave" know that she's off to visit her, allowing another opportunity to get out of the house and into the White Knights' Castle. Once there, the player happens upon a Metal Gear Solid-esque scenario requiring that the player evade the notice of a few white knights, very similar to quest mechanics typical from a decade or so ago. The first knight must be distracted in a different way and, after a bit of examining the surroundings, the player crafts a sort of homemade bomb that then summarily blows the unsuspecting knight over the wall, leaving only a pair of charred boots. From here, the "maze" is fairly straightforward (and seems to be able to be cheesed by just running through most of the time at the time of writing) and once through, the player arrives on a tower with a knight barbecuing and Sir Amik demanding drinks be brought to him. Once you get Sir Amik completely sloshed, he reveals that the secret meeting is in a Kalphite Hive in the Kharidian Desert. After this, the player returns back to home, Doris, and a fresh triple grounding with more chores. Thankfully, the chores go on this time without a hitch and a new cutscene is revealed. This time, real Dave is at Shantay Pass and moves on through on his way to the secret meeting. Upon the third waking, Doris leaves once again and soon after a family of new hell-rats announces that they have come over to visit (as this is apparently a regular occurrence). Taking three of these rats, the player decides they will compose the crack team needed to get through Shantay Pass and into the meeting. Once to Shantay, however, it seems evident that rats are a big problem for Shantay. To keep this section short, the player needs to find some way to smuggle the rats through the pass. To do so, the player rolls one through in a barrel, launches one from a coconut tree, and throws one from the wall of the city while within a coconut shell. The rats then help in finding and infiltrating the meeting, which the player helps interrupt. I'll be frank, this scene seemed odd and I didn't quite get what the purpose was. Maybe it was supposed to emphasize the fact that Dave's plan is absolutely stupid and that somehow summoning Zamorak into a meeting with Saradomin wouldn't really do anything. Regardless, the "meeting" ends with real Dave teleporting the both of you to Ice Mountain where Doris is for some reason talking to a monk when she spots the two, taking you both home. Back in the basement, the hell-rats volunteer to help in the evil body-swapping ritual which once again gets botched, but this time with the player regaining their body and only Dave and Doris swapping bodies. After the ritual, speak to Doris (Evil Dave) and quest complete! Although the quest was by no means perfect or super-spectacular, it was the fact that it was a normal quest with self-referential humor throughout which made it fun. It was relatively simple, seemed inexpensive and used a lot of already available assets, but still provided an hour or so of light-hearted fun. -Dave is his usual over-the-top evil in this quest. If you've done Evil Dave content before, this hits some familiar notes. -The bookcase dialogue is golden. The books are pun-riddled and the insistence made by the game that you not waste any more time after continuing to search the shelves is perfect. -It might be small, but the extra options when sweeping and washing dishes to fly away and to play in the bubbles are nice additions. -The fact that everyone knows Dave. WHY DOES EVERYONE KNOW DAVE? And more importantly, why don't they see him as crazy? This leads to the hilarity of the female general store clerk. She totally has a thing for Dave and it is absolutely inexplicable. -The fact that Dave somehow managed to buy up all the shadow dye and then waste it all on cheap garments. Classic Dave. 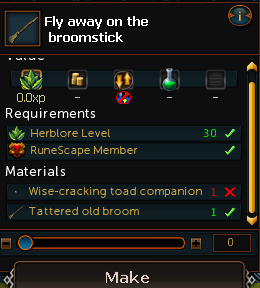 This is the kind of quest that you want to see every couple of months. 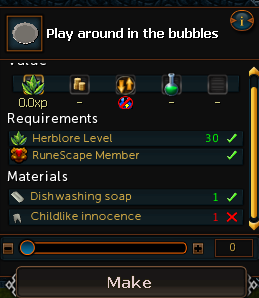 Something small, simple, but quintessentially Runescape. Next up will be in a few months so hopefully we can get something as a Christmas present to tide over those of us that love being sent on an adventure, no matter how small! Post subject: Re: [Informer] Evil Dave and DOOM DOOM, DOOMLY DOOM! i Honestly laughed outloud with the fresh prince easter egg. I haven't heard that in so long. I also had a great smile when it came to the watch. Loved it.